Manchester United manager Alex Ferguson reacted with a flash of anger when asked recently if his team were too reliant on Wayne Rooney. What, Ferguson was asked, would United do if their talismanic striker suffered an injury? "I'm not even thinking about that," the Scot retorted. "Do you want to stick pins in us?" 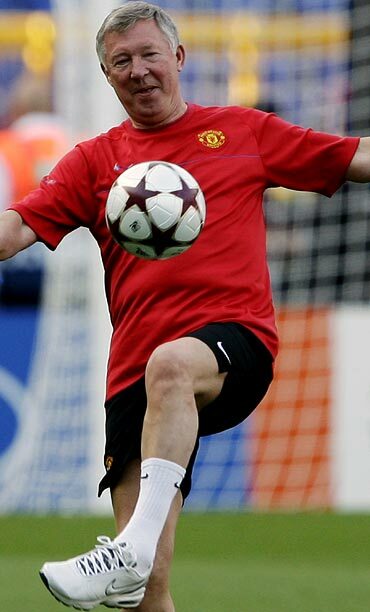 Ferguson was speaking at a news conference at United's secluded Carrington training ground outside Manchester the day after Rooney had helped himself to two goals, including a header worthy of his great predecessor Denis Law, in a 4-0 thrashing of AC Milan in the Champions League. 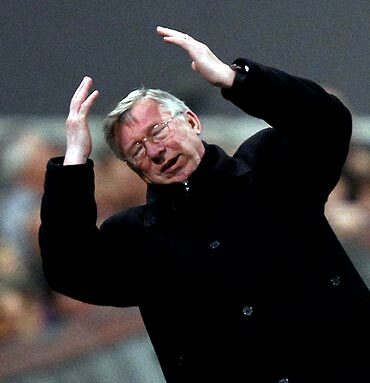 After refusing to think the unthinkable, the United boss slowly mellowed when invited to discuss Rooney. "His performance was a continuation of his form over the last two or three months, just sensational, unbelievable," Ferguson enthused. "What's improved is his movement in the penalty box. He's also practised a lot more than he has ever done. "After training he puts extra work in and that's what we're seeing now. He's reaping the rewards," added Ferguson. 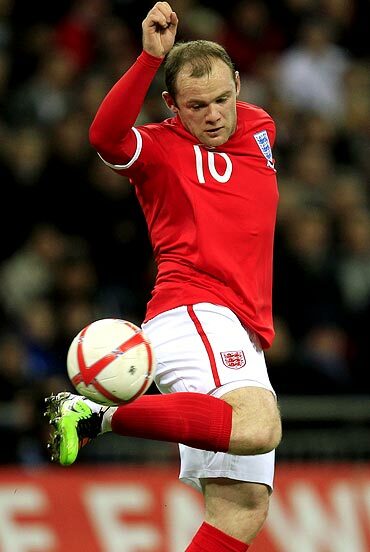 Rooney, who has scored 34 goals this season, is essential not just to United's Premier and Champions League campaigns but also to England's hopes at the World Cup in South Africa in June. So the dismay of Ferguson and England manager Fabio Capello, who was in attendance, was palpable on Tuesday when Rooney left the field injured in United's 2-1 Champions League quarter-final first leg defeat at Bayern Munich. To their mutual relief, after a tense day and a half, the club said on Thursday the England striker had suffered only minor ligament damage and no fracture. The timing, though, is unfortunate for United who face a home match against Chelsea on Saturday which could decide the fate of the Premier League. There are also potentially awkward fixtures to come at home to Bayern next week, Blackburn Rovers and Manchester City away and Tottenham Hotspur at home. If Rooney is his club and country's man of the moment, Ferguson, 68, who has been in charge since 1986, remains the man most readily identified with a club whose website (www.manutd.com) proclaims it the most popular in the world. Carrington, in rural Cheshire, lies at the end of a lane rambling through the countryside and is protected by 24-hour security. There is no public transport and a notice prohibiting the signing of autographs by the players discourages any fans who do make the journey. Pitches stretch into the distance and there is also a full-sized indoor Astroturf pitch, steam rooms, weight rooms and gyms. 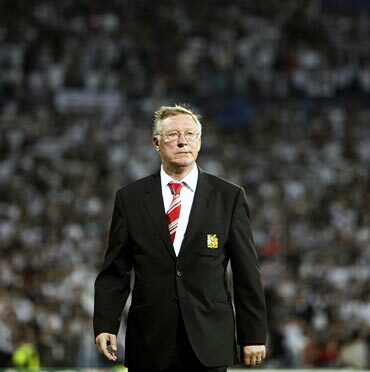 The overall impression is one of a stripped-down spartan efficiency which suits Ferguson's puritanical soul fine. "The journalists call this place Colditz," he once said. "That's right and that's just the way we like it." One of the outstanding crop of football managers produced in the west of Scotland, who include Jock Stein, Matt Busby and Bill Shankly, Ferguson is the longest-standing current league manager in England while only Busby has had a longer stint at United. If United do overcome the loss of Rooney for at least part of their campaign and finish first in the Premier League, they will overhaul Liverpool's record of 18 championships. "It would be a great achievement for us. It won't be done in a hurry again. The exciting thing is it is achievable," Ferguson said. "It's a hell of a haul. But it's not a matter of being one ahead of Liverpool, it's trying to win with excellence that is important. "When I've gone I hope to leave a legacy behind with a team that keeps winning," added the Scot.